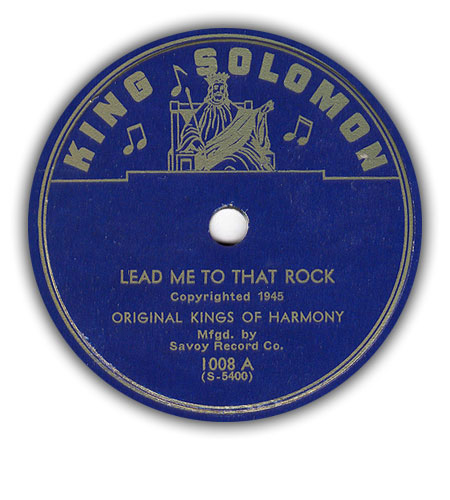 King Solomon was one of Savoy‘s subsidiary labels, releasing gospel between 1943 and 1948. See also the Manor and Regent discographies. The Deep Tones’ records (#1025, 1026) were also issued on Savoy with the same catalog numbers. King Solomon 1003 by the Kings of Harmony was released twice. King Solomon 1005 by the Kings of Harmony was also issued on Savoy 4008. The Heavenly Four of Alabama also recorded as the Heavenly Gospel Singers (Manor) and the Lincoln Gospel Singers (Regent). The missing numbers seem to be unreleased. This page lists all known King Solomon gospel releases from 1943-1948.